The Centre for Research on Migration, Refugees and Belonging, based at the School of Humanities and Social Sciences of the University of East London, is led by co-Directors Prof. Nira Yuval-Davis and Prof Gargi Bhattacharyya. It brings together the interdisciplinary work carried out within the School, in the related areas of migration and refugee studies; diasporas and social cohesion; racism, nationalism and political religions; as well as citizenship, identity and belonging. CMRB also collaborates with individuals, academic institutions and organisations outside UEL on research, conferences and seminars, in order to build knowledge on these crucial issues and provide a space for debate and creative thinking. 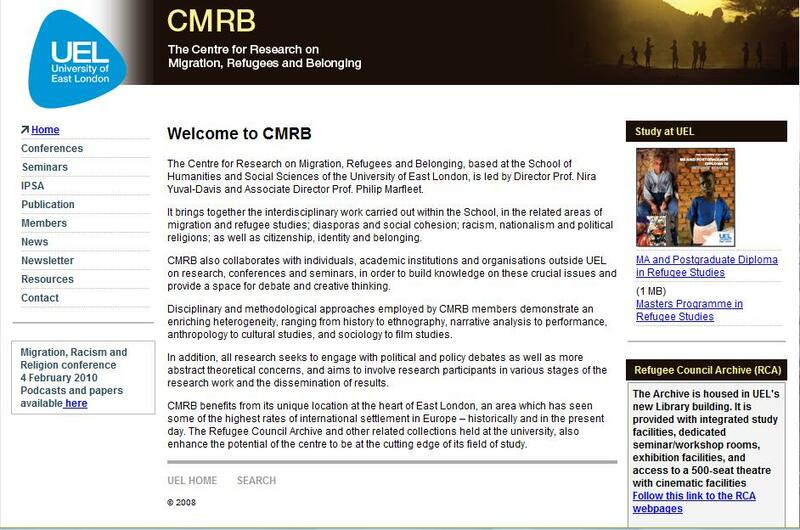 Further details on the CMRB can be found on their website at: www.uel.ac.uk/cmrb/index.htm and readers my also wish to subscribe to the CMRB mailing list which is hosted by Jiscmail.